Toronto launched its 2012 budget on November 28, 2011 with an overview presentation. Much of this has nothing to do with transit, and I will leave analysis of the full budget to others. For those who like the details, further information about the TTC’s Operating, Wheel-Trans and Capital Budgets can be found in the Analyst Notes. The City’s Budget Committee will consider details of the TTC budgets on December 6, 2011, and the Commission will debate the final version of its budget on December 14. Everything goes to Council on January 17, 2012. Defenders of the coming service cuts minimize the effect by saying that riders will only have to wait a bit longer, a few minutes at most, for their ride to show up at a stop. The attitude is that the change is trivial and, by implication, grumbling customers don’t know when they have a good thing. In fact, when headways are short, a few seconds change can make a big difference. The most striking example we can see every day is on the subway where only a slight extension of headways quickly translates to crowded platforms and trains, and long dwell times at busy stations. The same effect on a smaller scale happens on bus and streetcar routes all over the city. The change in peak period bus loading standards adds about 10% to the space between vehicles because the TTC now requires fewer of them to carry the same demand. If a route runs every 5’00” today (300 seconds), it will run every 5’30” (330 seconds) in January, all other factors being unchanged. This doesn’t sound like much until we convert the numbers to buses/hour. The line would go from 12 buses per hour to 11, and one bus worth of riders would have to be absorbed into the remaining service. However, the changes actually made on some routes are bigger than 10% because the TTC is compounding the new loading standard with a claw-back of “surplus” capacity. For example, on 54 Lawrence East, the peak headways go from 3’00” to 3’30” in the morning, and from 3’20” to 4’00” in the afternoon. Translated to buses/hour, that’s a change from 20 to 17 in the morning, and from 18 to 15 in the afternoon. The new services are 86% and 83% of the old ones, respectively. That’s more than a 10% cut. Updated November 27, 2011 at 7:00 am: The section describing the variations from budget for 2011 has been updated. Updated November 25, 2011 at 1:05 pm: I have written an article for Torontoist on the pending service cuts. Updated November 22, 2011 at 11:10 am: TTC staff propose that the 145 Humber Bay Express bus be discontinued after February 10, 2012. This route has never met the financial or performance criteria used to evaluate other services. After two years of a charmed life as a local Councillor’s pet project, the route is finally being held to the same standards as the rest of the transit system. When we are cutting services across Toronto, spending $150k/year to provide 70 people (140 trips) with their own bus service cannot be justified. TTC ridership numbers for September 2011 are up 5.1% over 2010, a level 2.4% above the budget projection. Under normal circumstances, this would be cause for celebration, but not in Rob Ford’s Toronto. Here we cut service even when riding goes up, all in the name of wrestling with a fictitiously inflated City deficit. The Chief General Manager’s Report tells us that riding will come in just a hair under half a billion at 497m for the year 2011, fully 10m more than the budget estimate. Those riders generate more revenue for the TTC, but don’t expect to see this in service improvements. As previously rumoured in comments, the Kitchener rail service begins on December 19. GO will implement this with two trains a day. In the morning, the existing 6:47 Georgetown trip will originate in Kitchener at 5:52. A new train will be added leaving Kitchener at 7:10 and arriving at Union at 9:08. In the afternoon, two existing Georgetown trips leaving Union at 4:45 and 5:45 pm will be extended to Kitchener arriving there at 6:42 and 7:42. The line will be renamed the “Kitchener” line. This article consolidates service change information for the three schedule board periods beginning October 9, November 20 and December 18, 2011. Service improvements continue to appear on a few routes in response to growth in riding. Whether these will survive into 2012 with the budget and service standards cuts remains to be seen. Updated November 17, 2011 at 10:00 am: Effective November 20, the Kingston Road 12A service to Variety Village will be split on weekends so that half of the buses travel via the original route 12B on Kingston Road east of Birchmount, and half via route 12A. This restores service to Kingston Road between Birchmount and Danforth Ave. Updated November 10 at 4:45 pm: Photos of the mockup have been added to this article. This shows the mockup (actually three sections of the five-section vehicle) including street level (front door) and island level (at the second door with a ramp deployed) comparisons for boarding heights. For more photos, scroll down to the bottom of the article. See also coverage on the Torontoist, Urban Toronto and blogto websites. Updated November 9 at 5:20 pm: In response to questions that have come up in this thread and previous articles about the new cars, I have added information at the end regarding the issues of weight-per-axle and the Toronto requirement that the cars negotiate single-point track switches. 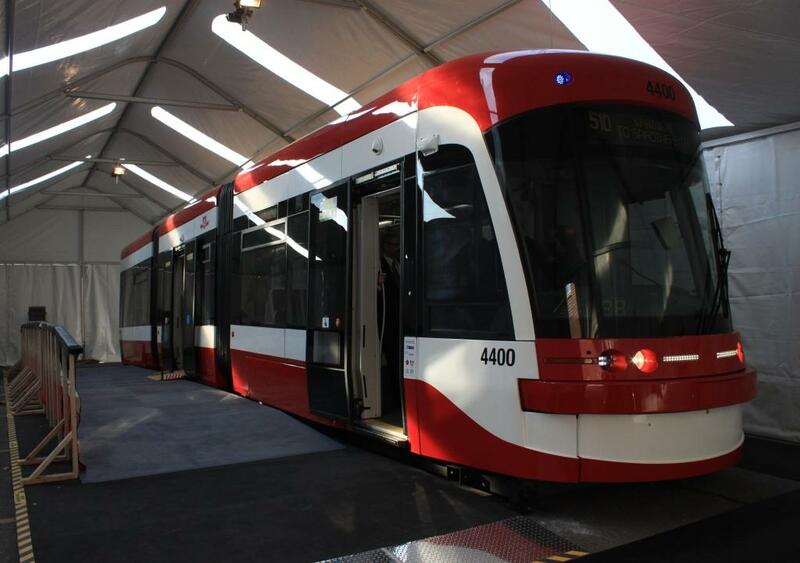 The TTC will display a mockup of the new streetcar fleet for public viewing. Additional information about this event and the new cars is on the TTC’s LRV Page. 39 years ago, the TTC decided to retain its streetcar system, and this will be the second generation of new streetcars. Toronto joins the rest of the world with a modern car based on designs used in other major cities. They’ve been a long time coming, and design changes have added almost a year to the process that TTC and LRT advocates expected when the order with Bombardier was approved. When I have details of the delivery schedule, I will update this post. For additional hi-res views of the new cars, visit the “Meet Your New Ride” page. Something that’s immediately obvious is a family resemblance to the interior of the new Toronto Rocket subway cars. Comments about the improvement of capacity on routes and the approach to scheduling service are now out of sync with statements in the TTC’s budget papers. Originally, the TTC was committed to improving capacity on streetcar routes and keeping wait times reasonably short. Today, this position is no longer as definite because running service above a full standard load is transit gravy. The new cars will operate, according to the TTC, on new routes for the eastern waterfront. Considering the foot-dragging on this project, the cost escalation and the low priority given to waterfront transit generally, it’s hard to say whether these routes will ever actually be built. Updates regarding technical issues with the cars follow the break below. Updated November 9 at 11:20pm: The Toronto Star reports that Queen’s Park has told Mayor Ford that it will not advance any provincial funds from a possible “surplus” on the Eglinton project to jump start the Sheppard line. This leaves Ford’s camp having to find money on its own if work on a first phase to Victoria Park were attempted. The Toronto Star reports that Rob Ford’s Sheppard Subway proposal might creep eastward from Don Mills Station rather than bounding in one leap to Scarborough Town Centre. An initial push east to Victoria Park might be a target for 2014, in time for the next municipal election, although the opening date would come later. Considering that Ford was going to finance and build the entire Sheppard line in that time, this is a tad slower than promised during his election campaign. The big problem, of course, is money. Ford doesn’t have much and, as the Star points out, the engineering difficulties for an all-underground Eglinton line won’t leave much unspent of the provincial fund earmarked for that route. For a route that was going to be financed by the private sector, Sheppard, or what we may see of it, is turning into a traditionally funded public sector project. The specifics are no surprise. Don Mills was always an odd place to end the Sheppard line, and this choice was dictated by available funding, not by network planning. The proposed LRT connection into Don Mills is less than ideal, and a tunnel under the DVP would be required regardless of the technology. The extra cost lies in continuing east to Victoria Park. What we don’t know yet is whether this extension would include a Consumer’s Road Station, or just go straight through to the new terminal. During the debates over possible adjustments to the Transit City network, a subway extension was one option proposed by some. The typical reaction to this (and to any other schemes that would add to the cost of Transit City) was to reject the idea out of hand because the overall budget was already very tight. However, now that Queen’s Park has decided that no price is too high to keep Mayor Ford happy, it’s much harder to argue against rethinking some Transit City options. Victoria Park could be a good terminal for a Sheppard LRT, but there’s a problem of timing. The “interim” subway terminal should be designed with provision for an LRT rather than subway continuation. I suspect that no one at the TTC will be allowed to even discuss, let alone design such an option. This will be a challenge for Councillors thinking ahead to a post-Ford era when LRT plans can be resurrected. According to the Star, Gordon Chong should be reporting on a scheme to get the Sheppard line underway “before Christmas”. Will Santa have a nice shiny subway train for little Rob’s stocking, or just a lump of coal? Meanwhile for comic relief, Matt Elliot’s Ford for Toronto site reports how that pesky Don River just won’t get out of Ford’s way. Thirty-nine years ago, the TTC made its historic decision to retain streetcars in Toronto. At the time service on streetcar routes was considerably more frequent than today, and Torontonians generally thought kindly of that mode. Over the years, it has been an uphill struggle to maintain this. Service cuts on the TTC led to fleet reductions, and improvements we should have seen go unfilled thanks to the too-small fleet of unreliable cars. We have been through one generation of “new” streetcars, and it’s hard to believe that these are now due for retirement. The CLRVs (regular sized cars) are over 30 years old and although they may physically be capable of continued operation and body rebuilds, their ancient electronics are a challenge. The ALRVs (two-section cars) are a bit younger, but still elderly. Ongoing debates about the type of car that would replace Toronto’s fleet and, indeed, whether 100 of the CLRVs would receive a major overhaul including new control systems, delayed the replacement process. This delay would be merely annoying had control of the Mayor’s office and Council stayed with a streetcar and transit friendly administration, but we’re now in an era where the streetcars are tolerated, not celebrated. A mockup of the next generation of Toronto cars, Bombardier’s Flexity, goes on display next weekend at Hillcrest Shops. Design delays, not to mention political foot-dragging, have this project running at least a year late. Meanwhile, construction of the new carhouse and maintenance facility at Ashbridges Bay has not progressed beyond site preparation. When the Streetcars for Toronto Committee (of which I was a member) advocated for streetcars, this was not just for the nostalgia of seeing rails in Toronto’s streets. “Light Rapid Transit” (LRT), a then-modern-sounding pseudonym for streetcars on reserved rights-of-way, could have brought an inexpensive network of suburban routes long before the suburbs as we now know them were built. Not until the Transit City plan, decades later, did we have an administration that took this concept seriously. Transit City had its flaws, but these pale beside the madness of an all-underground alternative foisted on Toronto by Mayor Ford and Premier McGuinty. Engineering challenges may force a rethink for Eglinton’s valley crossings at the Don River and other locations, but these will come grudgingly and the original surface alignment is at best “on the back burner” until less hostile forces occupy City Hall. The rest of Transit City is so far in the background that even the name has been expunged from official use except as a slur against the Miller years. Day-to-day transit service is under attack from City budget cuts and Provincial underfunding. Toronto’s recent history of strong ridership may continue only by an accident of high energy prices and traffic congestion, not from an active plan to serve growing demand and population. This is really not where I had hoped to see our transit system by now. The 40th anniversary will come in 2012 when transit will still be fighting for its life politically and financially in Toronto. We should have been celebrating a renaissance. Readers of Douglas Adams will know that “42” is the “Answer to the Ultimate Question of Life, The Universe and Everything”. What will 2014 bring? Updated November 3, 2011: Video, audio and the presentation materials from this event are now available. I have added a few written comments to expand on my presentation deck. On Tuesday evening, October 25, 2011, I gave a talk with Eric Miller as part of the University of Toronto’s Cities Centre series “Toronto In Question”. Please visit the event page on the Cities Centre’s site for video, audio and powerpoints. For those who want a smaller version, here is a pdf of my slide deck. As a quick overview, and to expand on a few points that were left out of the talk, a quick runthrough of the slides follows the break below.